Bishop Gerald Wiesner, OMI, has been a great friend, teacher, servant and shepherd to many across Western Canada over the years. He is known and loved for his gifts as an educator, serving as a professor of theology at St. Charles Scholasticate in Battleford, Saskatchewan, and then at Newman Theological College in Edmonton until 1992, when he was appointed Bishop of Prince George, B.C. His commitment to adult faith formation has been continuous, whether through the establishment of a lay formation program in his diocese, or through the many workshops, study days and retreats he has given across Canada. Thank you, Bishop Wiesner! May you enjoy a blessed, happy and well-deserved retirement. The Bishop Wiesner Endowment Fund was established to support priestly formation and theological education at St. Joseph Seminary and Newman Theological College. If you would like to thank Bishop Wiesner in a special way for his years of service and leadership, please consider making a donation to the fund that bears his name. 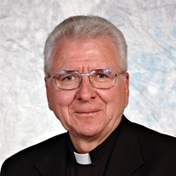 Bishop Wiesner will be informed of all donations to this special fund. Or email using the Contact Us button.